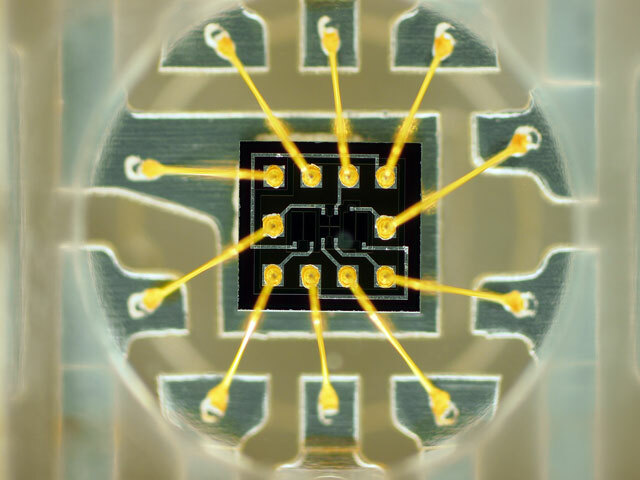 www.photomacrography.net :: View topic - Early Optical sensor microchip. 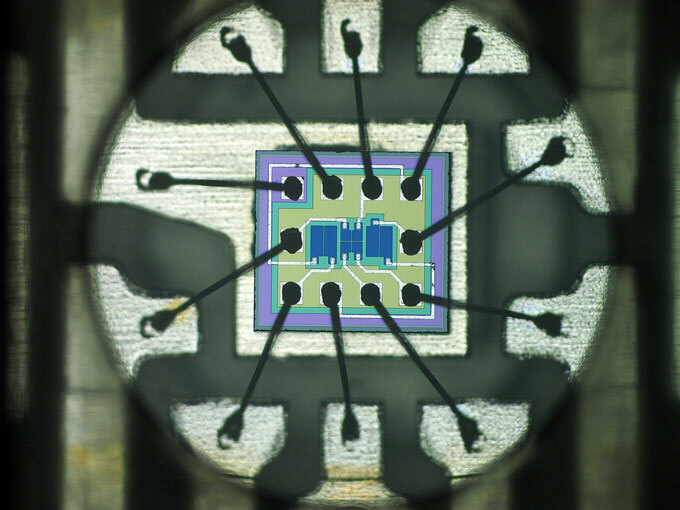 Posted: Thu Jan 30, 2014 4:17 am Post subject: Early Optical sensor microchip. All images were taken with a Mplan 5x objective. Many thanks to Rik for his willingness to help me regarding the difference between "epi darkfield" and "epi brightfield" illumination methods. Posted: Thu Jan 30, 2014 4:55 pm Post subject: Re: Early Optical sensor microchip. Think about looking at a flat mirror surface with some dust on it. With epi brightfield, the illumination light travels out through the objective lens, hits the mirror, and reflects back into the objective. In this situation the mirror appears bright; any dust on it will be dark. With epi darkfield, illumination light travels out around the objective lens, hits the mirror surface, and reflects at an angle such that it does not get into the objective. In this situation the mirror appears dark; any dust on it will be bright. So, epi brightfield and darkfield are named for the appearance of the mirror -- the flat featureless "field". This is shown in the above photos. In the first image, flat shiny surfaces are bright and everything else is dark. All we see are direct reflections. The colors are due to thin-film interference on the flat surfaces. If you look very close, small bits of the gold wires will be bright, where the surface happens to lie flat in the plane of focus. In the second image, flat mirror surfaces are dark (the "black hole" effect), and everything else is bright. This is the illumination that we're used to seeing, so it looks the same as usual. If we were used to looking at the world in a dark room illuminated only by beamsplitting eyeglasses that acted like light was coming out of our eyes, then the first image would look more "real". Very informative post--both the images and the explanation. Interesting how each image conveys different useful information. Studying the images--particularly the top one--I find myself curious to know more about what we're looking at and how it works. Is this a small array of photodiodes? If so, why are there apparently three? Why do two appear to be addressed twice (which makes intuitive sense), but one addressed four times? Are the fine green lines divisions between P and N regions?